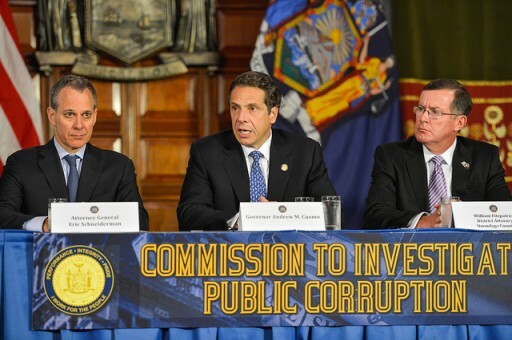 Albany, NY - Allegations that his administration meddled with a state anti-corruption commission are posing the greatest political test of New York Gov. Andrew Coumo’s tenure — and producing some verbal gymnastics. The New York Times reported last week that a top Cuomo aide pressured the commission to stop subpoenas to a media-buying firm that Cuomo used and to a real estate organization whose members financially supported his campaign. The Democratic governor says the commission’s ultimate rejection of his administration’s request shows there was no interference. He also says the commission acted independently, though he’s said before that it was firmly under his control. With Cuomo ahead in polls and fundraising, SUNY New Paltz political scientist Gerald Benjamin said Tuesday that unless something changes, the episode is unlikely to alter Cuomo’s re-election chances.